How Do Penny Auction Websites Really Work? – Penny Auction Scams Exposed! Is Wavee.com A Scam? Wavee Penny Auction Website EXPOSED HERE! You probably found this website because you are wondering if Wavee.com (Wavee) is a scam. Well, you’ve come to the right place. In this Article, I am going to tell you exactly how Wavee.com works so that you know the inns, the outs, what to expect, and what you are getting into… And then you can see for yourself whether or not Wavee.com is a scam. These Penny Auction websites keep re-branding themselves over and over again when the press for a version gets too bad. First it was called Swipe Bids, then they changed the name to Swipe Auctions, now they are up to their third iteration (Since I have started writing about them). This New penny auction website’s name is Wavee.com… however it is essentially the same as the older versions of the website with a few changes. OK, SO Is Wavee.com A Scam? Believe it or not, I get a LOT of comments saying that people simply didn’t notice that area where it says they will be charged $179! And this is a trick Wavee.com uses on their end, by causing you to scroll and scroll to get to that section (The scrolling causes you to get distracted), as well as using large flashy graphics, combined with the fact that it almost looks identical to the first registration page, it really can be easy to not notice where it says you are being charged. And this directly goes against recommendations by legitimate United States based payment processors as well as guidelines set by Visa and Mastercard. These entities state clearly that flashy graphics should not be used to distract users from the total amount they are paying, or the terms and conditions. They also state that the final price the user is paying should be within 100 pixels of the submit button. In this case, Wavee.com also does not say “place order”, they simply say “start bidding” which is another deception on its own. It really is relatively easy to miss the area where it says you will be charged $179! So Does That Make Wavee.com A Scam? Well I’ll let you be the judge. I feel it is very deceptive. Where they have made an improvement over older versions of the website are where you actually have to check a box to agree to terms and conditions, which really helps them only on their end. It does make consumers do a double take, and they might read them, but most of the time, consumers still skip these… And because they checked a box, its harder for the customer to argue that they did not agree to anything the website wants to do. So what about those Wavee.com terms and conditions? “we may allow Credits, used for an unsuccessful bid, to be applied to the purchase of the same item as was the subject of the auction in which the Credits were used or, at our discretion, similarly priced items in the same auction. The purchase price will be the same as the “retail value” of the item, as posted for the auction.” – This is something you need to watch out for! Wavee.com claims these retail values seemingly randomly… On most penny auction websites, if you loose, it’s all money down the drain. 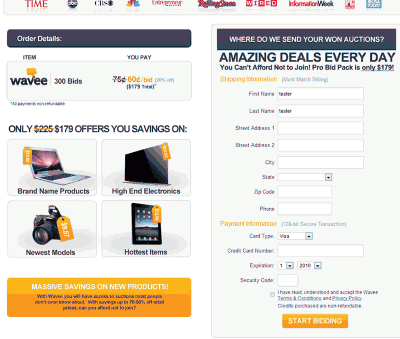 On Wavee.com if you loose an auction, you can apply the amount you spent in bids towards buying the item for their “retail price”. But this retail price can be 20% more or higher than what other websites like Amazon.com would sell the same thing for… So you’re not necessarily still getting a deal. They say they “guarantee” the lowest prices but this simply is not the case at all (see number 3). “Retail Products do not include any items sold on other auction sites, items sold open-box or during clearance or liquidation sales” - So they match “Retail Prices”… And apparently things that are on sale are not “Retail prices”.. So If amazon.com and every other online retailer is selling it for 20% less than Wavee.com… It doesnt matter because they don’t have to price match clearance or “on sale” items. “Wavee reserves the right to limit the number of auctions a user may participate in or the number of his successfully finished auctions at its sole discretion.” - Have you been winning too much? If wavee.com think’s you’ve been winning too many auctions, they can just keep you from bidding at their sole discretion.. Maybe they let you bid they just keep you from winning, who knows? They say they can limit the number of successfully finished auctions at their sole discretion. Seems very fishy to me. “The right to use any Credit expires, if not used within 180 days of the date purchased or otherwise obtained from us. Wavee reserves the right to expire Credits acquired with a discount of more than five percent off of the regular posted price at any time after 90 days from the date purchased or otherwise obtained from us.” – Better use those credits because they expire!! “Buy-now offers will expire within 24 hours of the end of the applicable auction.” - Not only does it expire after 24 hours, if you are interested or want the price lowered to match somewhere else, you have to contact them and hope to hear back within this 24 hours! Not very likely! So Is Wavee.com A Scam? I’ll leave that for you to decide now that I’ve shown you the areas you should be concerned about on this particular penny auction website. Want to know more about the inner workings of Penny Auction Websites In General? I have written a long article that goes into the entire process of how penny auctions work, the bidding process, the users, the fee structures that are similar across all penny auction websites. Visit the link below to learn more. 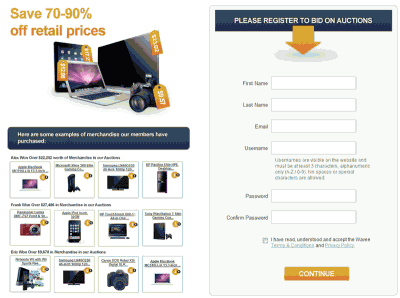 Penny Auction Websites EXPOSED – WHAT YOU REALLY END UP PAYING!! Is QuiBids A Scam? Learn about how QuiBids Works Here!